Today is World Hello Day! The 39th annual World Hello Day. Anyone can participate in World Hello Day simply by greeting ten people. This demonstrates the importance of personal communication for preserving peace. So… A big Hello to you all. A week of snow, winter tires, introduction to paraben free lipgloss, wet snow gear, a wet dog, lost gloves, sledding, blue skies, interesting clouds, sunshine, the letter ‘I’, science tests and decorating. We all have inspirational people and projects in our lives, here are some I have been inspired by this week, those who are seizing the day. The Hope Centre, Willow Park Church. Kelowna. I volunteer at the new ‘Hope Centre’ at our church. Open 9-3 everyday. Free coffee, good food, wifi. A safe, warm comfortable place for our community to visit. Our visitors? Many need company. Many come through looking for direction, resources and guidance. Each week at Willow Park, church community bring donations of diapers, wipes and formula for the baby basket. Each day we see parents coming into the Hope Centre for their supplies. This week I saw many new faces, many obvious reasons will bring them to use this service. They are grateful. And so are we. I’m excited to join in with what God is doing through the Hope Centre. As the temperature drops and Kelowna is white. We are even more grateful for this community. If ever you have thought of sponsoring a child whether through Child of Mine or Compassion. Please, please take 5 minutes to read this powerful post from Ann Voskamp and her visit to Ecuador last week. These are real lives loving real people. In 2008, UNICEF declared that more than 45% of people lack access to a safe water source. Currently, 60% of rural village deaths in Kenya are caused by illnesses related to unsafe water and sanitation. Sadly the vast majority of these deaths are children under the age of five (Ministry of Health, Kenya). My friend Debra Brosseuk, an artist in Kelowna has been traveling in Africa for the last few weeks. She is a potter and involved in the ceramic water filter program. 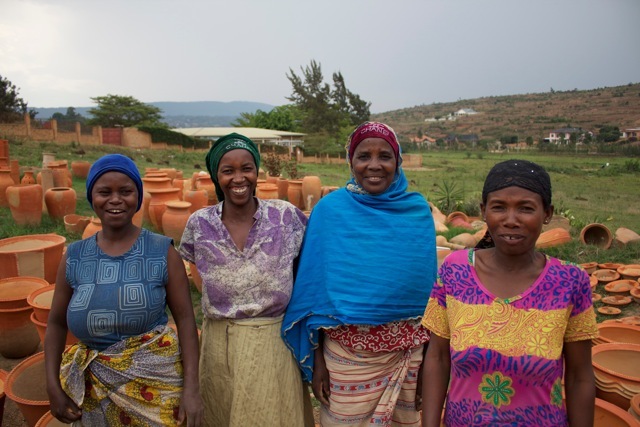 Her focus in Rwanda was to continue to encourage the poorest local potters with the project. Educating local people in the dangers of waterborne diseases and the health risks associated with water drawn from lakes, rivers, streams and swamps. She also teaches the importance of filtering water, and how to maintain the ceramic filters. In the New Testament witness continues to have an active sense. The disciples were witnesses and were often intentional about bearing witness. They openly and publicly testified about what they had learned and seen while with Jesus. But their witness was much more than their words; it was a whole way of life. I am grateful for opportunities to be a witness and to be surrounded by those who are seizing the day. Michelle, you’re words are inspirational….keep writing!